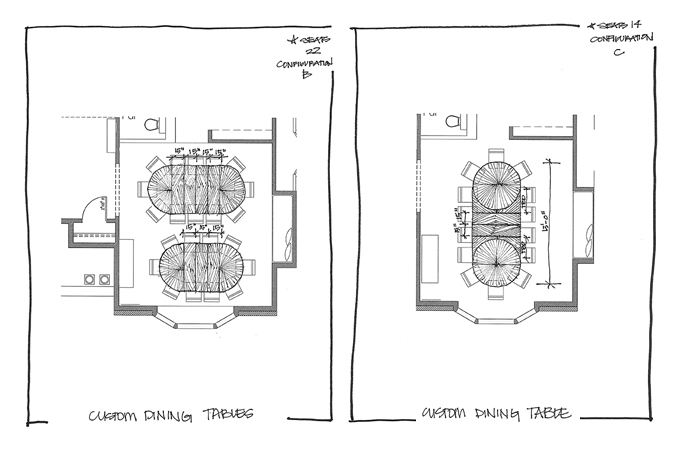 As you may or may not know, one of my favorite parts about the design process is working out the schematic to fulfill or even surpass a client’s spatial needs. Last fall, I got the design challenge of a lifetime when one of my favorite clients requested seating for 16 (yes 16) in her average-sized dining room. Before panic ensued, I knew I would turn to one of my favorite contemporary furniture designers, Dakota Jackson, for his superior craftsmanship and flexible designs. 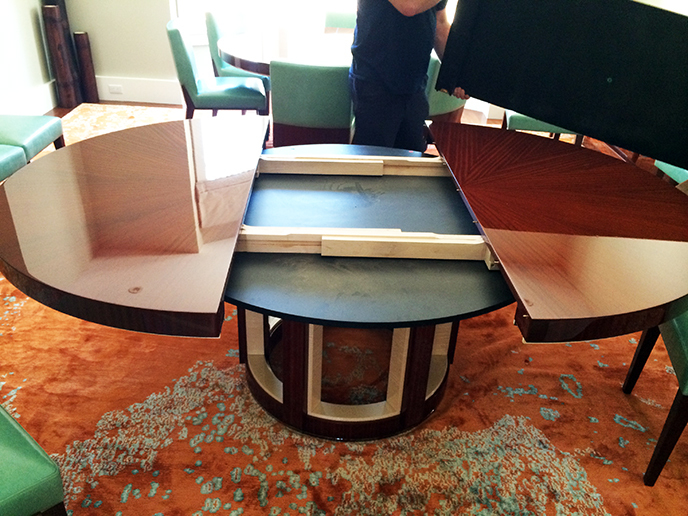 Almost immediately, the team and I headed out to the Dakota Jackson showroom in NYC to view a spectacular 2-toned, tea mahogany and sycamore dining table called Oceana. In my opinion, it’s always important to have the client present to see, feel and fall in LOVE with the furniture they are investing in. Their presence also gives us the opportunity to determine the perfect heights, clearances and accompanying chairs before we fly back to Boston and put pen to paper! DAKOTA JACKSON: PROFILE – The following is an excerpt from Dakota Jackson’s biography on his website. His fascinating upbringing has surely influenced his avant garde style! In a career spanning over four decades, Dakota Jackson has been one of the leading figures in American furniture design. Since the early seventies, when he emerged as a major contributor to the Art Furniture movement, each of his seminal designs has been a combination of exquisite craft, intriguing engineering, and original form. Born to a family of professional magicians, in a world filled with escape artists, mind readers, and bullet catchers, Jackson grew up on the stage, where he learned the extreme discipline of the performer. As a young man, he immersed himself in the minimalist dance and performance art scenes taking shape in the abandoned factory lofts of 1970s Soho. These experiences with illusion and spectacle have deeply informed his design sensibilities. 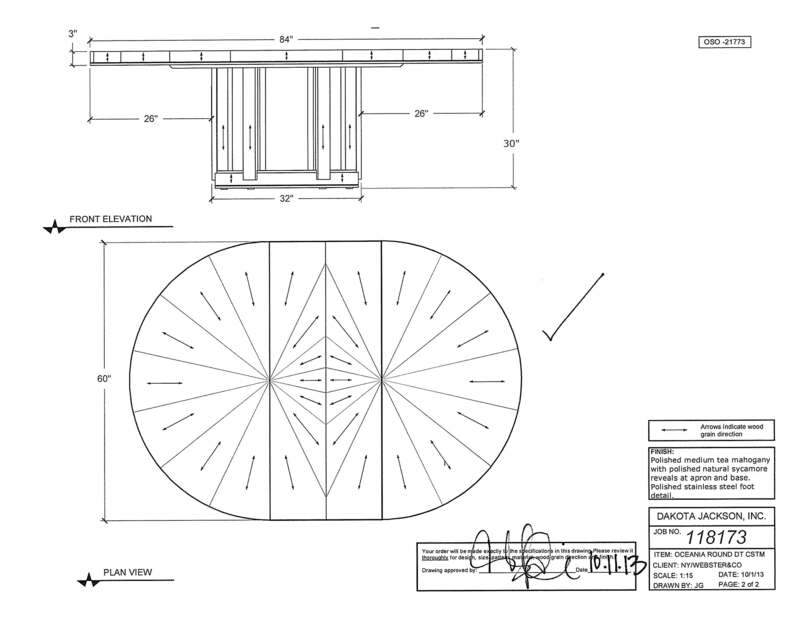 After much exploration, and lots of coordination with Dakota’s design team, we settled on a pair of 60″ round tables that expand with (1) 24″ leaf each, to seat 16 guests during dining parties. 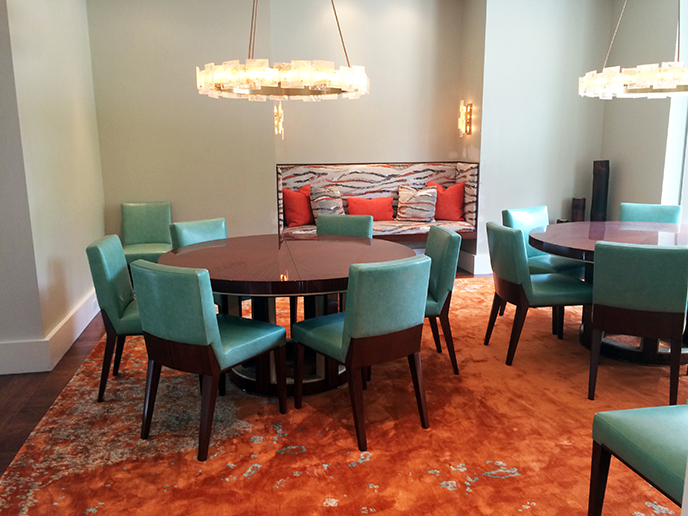 The finished product is stunning and the client finds the layout efficient, flexible and most importantly… fun!